Pass through an Ayleid realm of portals to locate the lost Remnant. Kassandra, having evaded Jaxsik-Orrn and Xukas, entered a second xanmeer called Vakka-Bok. Famia and I must enter this vast ruin and prevent Kassandra from acquiring the Remnant of Argon. "I think ... I think I know why I'm here. I'm supposed to bring the Remnant back." Enter the Vakka-Bok Xanmeer with Famia. Navigate your way through the xanmeer until you reach a cavern with a deactivated Welkynd gateway. Obtain the Welkynd Stone, reactivate the gateway and enter. Head into the small welkynd gate to the northwest to pursue the traitor. 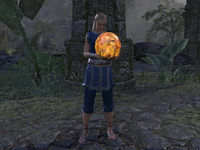 Look for a usable Vakka Stone in the Ayleid Ruins using the Nexus. 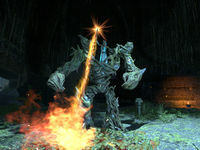 Use the obtained Vakka Stone to reopen the gate to Deep-Root. Fight your way through Deep-Root until you reach the chamber of the Remnant. Fight the Colossal Miregaunt and Kassandra. Head up to the village via the newly created vine ladder. I need to enter the Vakka-Bok Xanmeer with Famia and try to catch up to Kassandra before it's too late. I found a massive Ayleid gate. According to Famia, we need a power source to activate it. I should search the cavern for a suitable welkynd stone. I found a welkynd stone. I should take it back to the Ayleid gate and place it in the sconce nearby. With any luck, the gate will activate. The welkynd stone allowed us to open the massive Ayleid gate. We should see what awaits us on the other side. 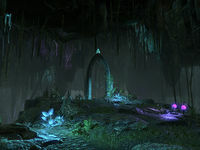 Kassandra used the Kajin-Jat Crystal to escape through a mysterious Ayleid gateway that draws its power from the Argonian vakka stones. The gate deactivated as soon as she left. I should discuss our options with Famia. While Famia watches over the gate, I need to go find a vakka stone that can activate the Ayleid gate. I found an intact vakka stone hidden in a maze of Ayleid laboratories. I should take it back to Famia. Hopefully it will activate the Ayleid gate and allow us to pass through to the next leg of our journey. 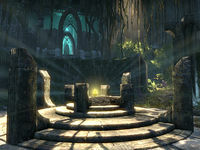 The vakka stone activated the mysterious Ayleid gate. I must pass through it to continue pursuing Kassandra. I caught sight of Kassandra, who seems intent on stopping Famia and I from going any farther. I need to make my way to the Remnant, even if it means going through her. Kassandra fled deeper into the cavern—perhaps to the final Remnant chamber. I need to follow her. Kassandra touched the Remnant of Argon—resulting in an explosion of vines, and the emergence of a miregaunt with her inside. I must defeat Kassandra, and the creature she occupies. I was forced to kill Kassandra, but Famia managed to retrieve the Remnant of Argon without any ill effects. 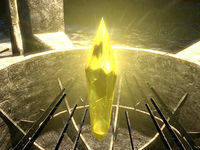 We should take the relic back to the surface. Finishes quest We arrived back in Root-Whisper Village with the Remnant. I should talk to Famia about our next steps. This page was last modified on 18 December 2018, at 01:40.